Integrity in a Man’s Life – Idealistic Nuisance or Pleasurable Necessity? During my first two years of college at Stony Brook in Long Island, I became very excited about studying filmmaking. With my friend, David Kramer, we spent 16 hours shooting a two-minute animation starring a Tensor lamp as the hero, and a wire hanger with strands of yarn for hair as his leading lady. I especially liked the editing process–trying to bring together many pieces of footage to make a coherent whole. We were trying, as I was to learn from Aesthetic Realism years later, to put opposites together: oneness and manyness, unity and variety, truth and imagination. And these are the very opposites that a man is in the midst of as he goes after integrity in his life. Learning the difference between using my mind to have respect and using it to have contempt, has made the difference between the waffling, nervous person I was, and a man who feels, “I have a chance through the many things I meet to be more whole, more who I want to be!” I thank Eli Siegel for this knowledge, and for what I’ve learned and am learning now in classes taught with beautiful scholarship and kindness by Chairman of Education Ellen Reiss. Growing up in Yonkers, I loved singing in the choir in elementary school, feeling I was expressing my individual self and also blending in with many other voices. And in 10th grade, when we learned plane geometry, I was in awe at the definite, unchangeable axioms that are true about every triangle, rectangle, and circle. These were instances where I had respect for the world outside myself, and were in behalf of my integrity. In college, I changed my major from Engineering to English to Theater to Biology to Religious Studies. I was worried by the way I would lose interest in things I had at first been so enthusiastic about. I felt scattered and purposeless, and despaired of this ever changing. I was beginning to see how much it did. My consultants encouraged me to study this question: “What will establish Kevin Fennell in this world: wanting to know other people and be known, or wanting to hide and fool people?” I saw that my thirst to feel superior to people while I acted like a well-meaning “good guy” was at the root of my feeling so counterfeit and hollow. And I began to have the honest pleasure and self-respect of wanting to know other people and have them know me, not to put on a show to one-up somebody else, but really to see another person and be seen. I’m grateful in these years to be learning how to have that unity of purpose Mr. Siegel described, with every situation and person I meet–including with the woman I love so much; my wife, Carol McCluer, and our daughter, Sara. 1. You try to find out what you most want and stick to that. 2. You try to please people, not by playing on their weakness, but by bringing out their desire to see. 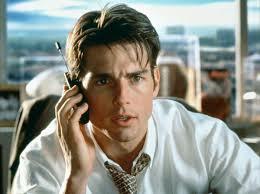 The 1996 film, Jerry Maguire, written and directed by Cameron Crowe, is about the struggle in a man to be an integrity, “to find out what [he] most wants and stick to that.” The movie is told in flashback by Jerry Maguire—portrayed very well by actor Tom Cruise—a slick, attractive, exceedingly personable sports agent for a big multi-million-dollar agency. We watch him flattering athletes at sports events, flashing an insincere smile, telling them “I kill for you. I’m an animal for you”; pressuring owners to sign big contracts, and bragging about the deals he’s made. Two nights later in Miami at our corporate conference, a breakthrough. Breakdown? Breakthrough. It was the oddest, most unexpected thing. I began writing what they call a Mission Statement–you know, a suggestion for the future of our company. Suddenly it was all pretty clear. The answer was fewer clients. Caring for them, caring for ourselves, and the games too. Starting our lives, really. I think the reason this film was so popular is that Jerry Maguire shows the fight about whether integrity is an idealistic nuisance or pleasurable necessity. Jerry says: I’ll be the first to admit that what I was writing was somewhat touchy-feely–I didn’t care…. It was the me I’d always wanted to be. And we cheer him on, because he is trying to be true to the world outside himself and himself at once. There are two people in Jerry’s life who are forces on behalf of his integrity. One is football player Rod Tidwell, the one athlete who remains Jerry’s client–acted hilariously and movingly by Cuba Gooding, Jr. Jerry and Rod become friends and are critical of each other in ways that do each other good. Rod Tidwell is presented as lovable in many ways. He is a husband and father of a young child, and he is rightly furious about how he is seen and treated. The idea of professional teams “owning” their players and doing with them as they please, in its barbarity, is exactly in keeping with how workers in every field are seen in our now failed economy–as commodities to be used to make profit for someone else, and then discarded. The other person who comes to be central in Jerry Maguire’s life is Dorothy Boyd, a secretary in his former firm, played wonderfully by Renee Zellweger. Dorothy, a single mother with a five-year old son, quits her job to go to work with Jerry because she loves his Mission Statement. She tells her sister, “I love him for the man he wants to be, and I love him for the man he almost is.” You feel she wants to be true to the best thing in both Jerry and herself. Jerry begins to care for Dorothy, and also for her little boy. But we see that he is in a terrific fight between wanting to be affected deeply by her and also being cold, feeling he doesn’t need her at all. Rod Tidwell sees Jerry’s aloofness and encourages him to be honest. “You’ve got to have the talk,” he says. “If you don’t love her, you’ve got to tell her….A real man would not shoplift from a single mother.” Jerry tries to resolve this fight in himself by asking Dorothy to marry him. Yet he soon grows colder, she is very hurt, and they are both agonized. I have learned that the desire for contempt is the thing that makes it impossible for us to feel we are an integrity in love. The worst thing in us can resent needing a woman and the world she represents. Early in my marriage to Carol, I was troubled by a sense of distance between us, but I didn’t have the courage to question myself on where I had to do with it. Instead, I did what so many men have done: I got angry. Ellen Reiss: Do you think a man in Topeka now, engaged to marry a woman–do you think there could be something in him hoping she mean less? Kevin Fennell. Yes, I do. Ellen Reiss. Do you think you are in a terrific fight between having large feeling and small feeling–between whether you should care for anything outside yourself? A person comes into the world not to love himself, but to like the world–and that includes a woman as part of that world, and standing for it. I thank Ms. Reiss for showing me what I needed to see. This discussion changed my life and marriage. As I have the opportunity every day to know Carol, and want her to know me, I have feelings bigger and sweeter than I ever imagined. I love Carol very much for the depth of her mind, her beauty, her seriousness in wanting to have a good effect on people, for her thrilling work as an actress in dramatic presentations here; and for her desire to have Aesthetic Realism known by all people. Knowing her has made me more myself. The world, Eli Siegel explained, is the other half of ourselves. To have true integrity, to be wholly himself, a man has to see—happily and lovingly–his relation to every thing and person that exists. Through the kind and practical education, Aesthetic Realism, men everywhere can.